First of all, HOW COULD I MISS THIS SERIES? Oh my gosh, you should really know how excited I was when I finished this book. All the feels. FEELS! Mein Gosh. Now, where should we begin? Let me set myself in this sofa with my tea first because I just want to feel calm when telling this book. We have Kady Grant, your teenager who just broke up with her boyfriend. Figures, huh? And then, out of nowhere, their planet was invaded, but it’s not earth, don’t worry. I don’t think they even mentioned Earth in the book, but nevermind, let’s go on. Then as the main protagonists in the story, of course she has to survive, of course she has to gain the key to help her people to safety, and of course, she has to realise her love for Ezra (her ex-boyfriend) is more than anything. And of course, I forgot to add, we have to have a big ship after Kady and friends; and a MAD Artificial Intelligence called AIDAN. Which I think need to be a friend of mine and come to my tea party. 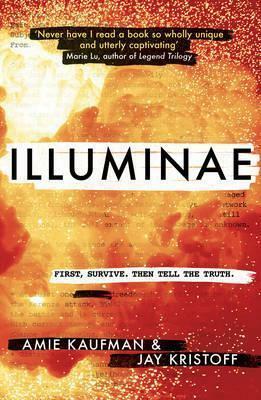 Illuminae has a different layout than the most novel out there. It is more of collection of files, but still connected to each other. I notice there are at least 6 styles: The Chat style, the description from the video camera style, AIDAN’s style, The e-mail style, Kady Grant’s journal style and random styles like wall notes, etc. Now, it’s confusing at first. I almost gave up, but since I have the book with me and I’m in need of something to occupy my mind otherwise I could go even madder, why not try the book then? Then it blows my mind, not literally of course. I like the styles of Illuminae, unique, but still give you a story. It feels like you are somewhere in the future, far far away, where you went to a secluded planet, found a book there and read all the journals. To read a story that should be told to the world. The plot, the conflict are so intense. Did I mention you there’s a zombie inside too? Probably not yet, but don’t worry, this is not a zombie story, just a little bit of it is there. Anyway, all need to be there, everything is essential to create the story called Illuminae. And when it came to the ending, a twisted but wonderful ending, you just want to dig into the next chapter already. And I did! But I’ll tell you about that later. Now, let me enjoy my tea and hope you’ll read the book then enjoy it together with me too. But, just don’t go mad like AIDAN, or like me. Obviously. I like your site, it has nice content, Many Thanks. Aww, thank you so much! Love that you like it!